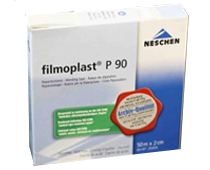 Filmoplast P 90 is made from a white, tear resistant paper and coated with Neschen’s own age resistant acrylic adhesive. filmoplast P 90 is widely used to hinge those works of art that do not warrant wheat paste and rice paper hinges. Both the adhesive and paper are buffered (pH 8.7 aged) so the tape remains acid-free for decades after application. Like all pressure sensitive tapes filmoplast P 90 should be burnished upon application with a clean bone folder to achieve the optimum bonding strength.